It's that time of year again when the ballast needs topping up. 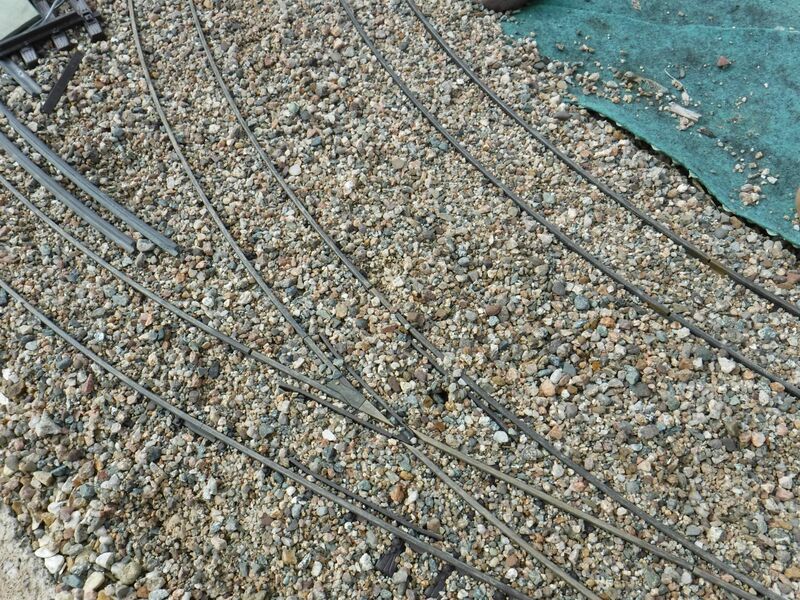 In the past, when I was using track power, I would only patch up the ballast in places where it was getting bad so as to ensure that the track remained clean and level. I was always careful not to get dirt and grit in the joints and connections. But now as I've changed over to battery power, I'm not a'feared anymore so i'm going to lay it on good and thick! 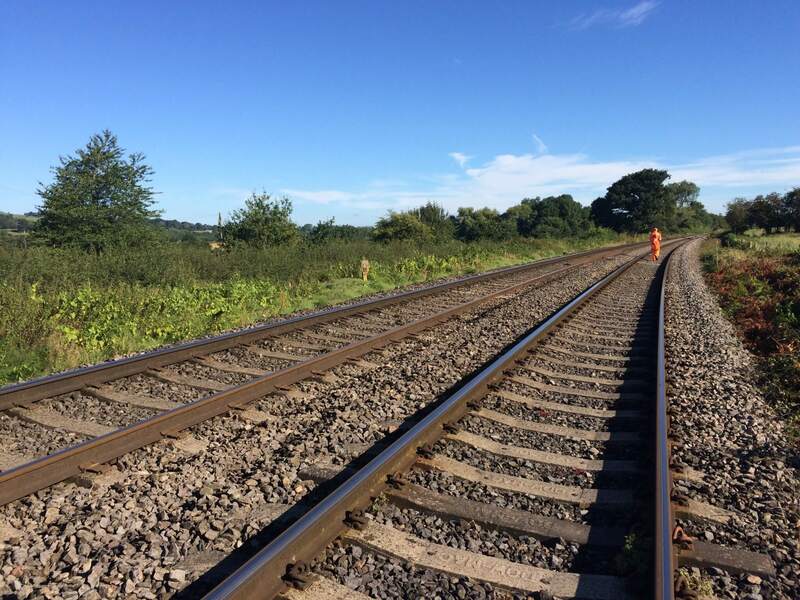 Originally the track was kept firm and level but looked very bare. So it was off to the shops for some *Potting Grit* which looks very mucky in the bag! 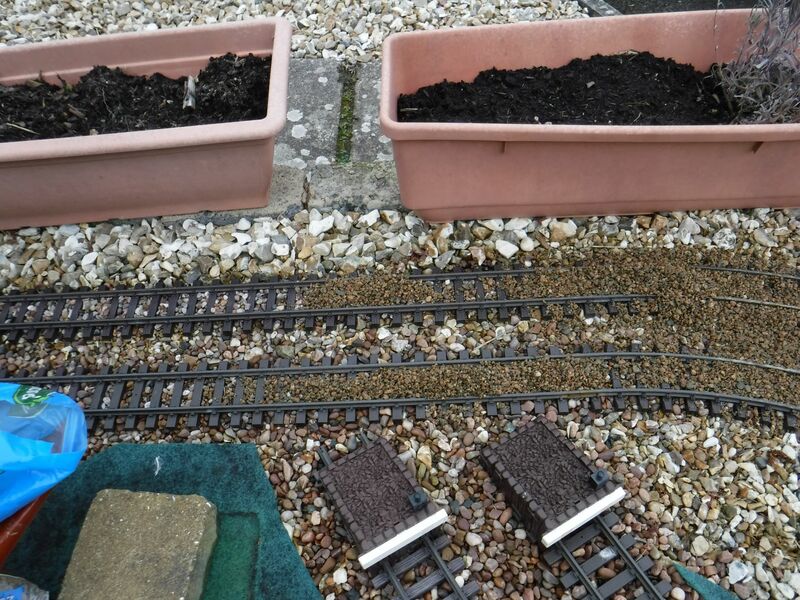 First I trowel it onto the tracks and then level it off with the back or side of the trowel and eventually a nice even spread is achieved. Now, on a hot sunny day this would start to dry out in an hour or so and I could move on to the next stage, brushing and clearing the points. But it's cold and wet so we'll have to leave it for now until part 2. 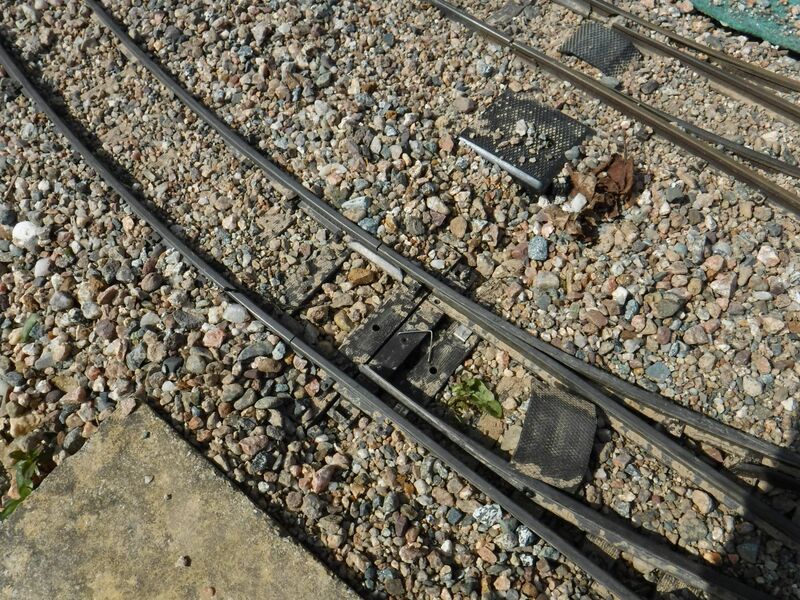 Looking at the bag, there seemed to be larger rocks mixed in with the "grit", but you pictures on the tracks show only fine grit. Did you sieve out the larger stones? Are you intending to fix the grit with an adhesive? No large stones. The photo in the bag is a close-up. The description says 4-7 mm grit but I think there is also course sand or other material in there. Hopefully the sand will wash off the surface and leave the grit showing. I'm not planning on fixing it with anything but if it washes away too much, I might have to. I think you will find it washes away pretty easily, but the adjacent slope has a lot to do with the "migration" as Rhino says. 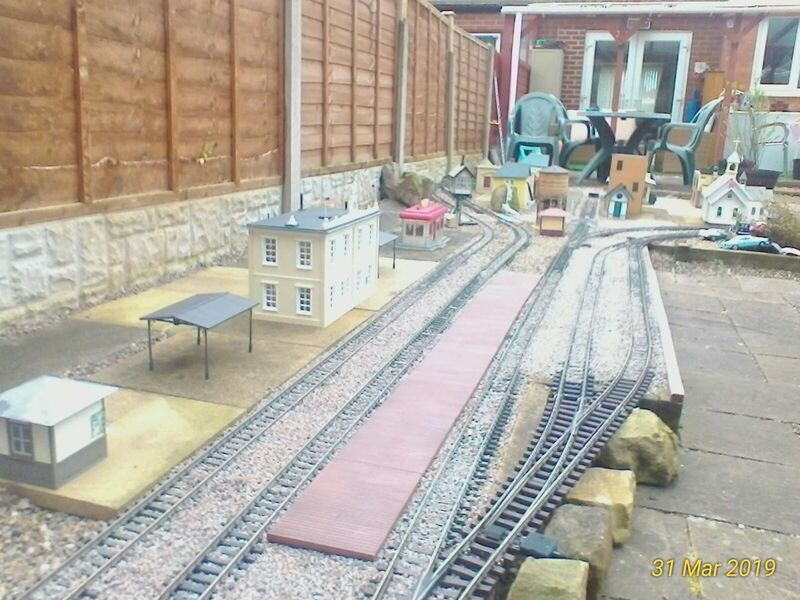 A dilution of normal carpenter's glue sprayed on the ballast will not show, but will keep things in place better. That is pretty similar to the stuff that I recently got hold of. 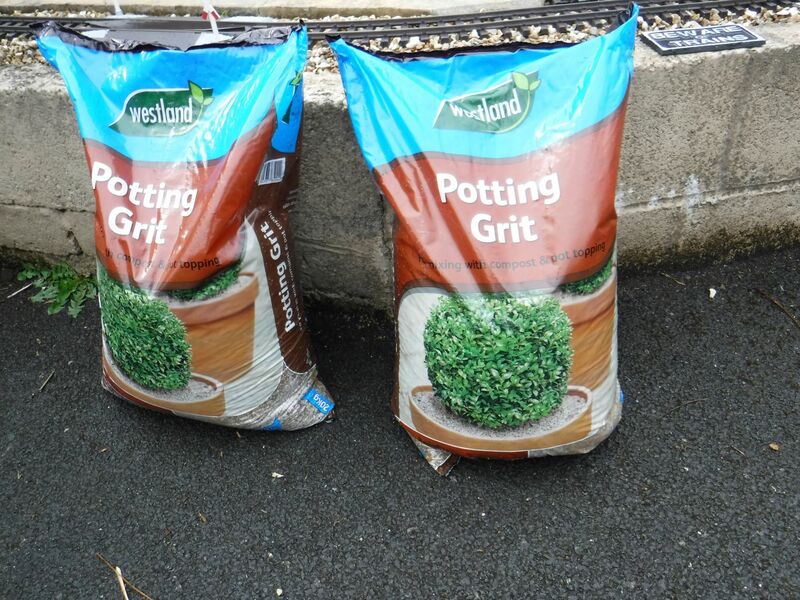 Just a word about Potting Grit, some suppliers have a different view of what it is or the size. So be a little picky on what you buy as you can end up with some of the stuff that was in place before ERIC got the 4-7mm Grit. My nearest GC (Garden Centre) near the Black Cat had the same as his original stuff Sood as Potting Grit which I reckon to be 8-12mm which is far too big. I tried another GC near HUNTINGDON and they had the latest stuff that Eric has shown us on his line. Much better but still a little large for my needs. I may be sifting some down to get 3-5mm but still have the problem of it being not Grey! You can pick up the right stuff at Shows but it is very pricy and comes in Pathetically small Amounts. I get mine from Home Bargains, does the job nicely. I may be sifting some down to get 3-5mm but still have the problem of it being not Grey! You can pick up the right stuff at Shows but it is very pricy and comes in Pathetically small Amounts. I'm quite happy with the colour. In real life, it may start out as grey (granite) when it's first laid, but it will eventually end up looking brown. 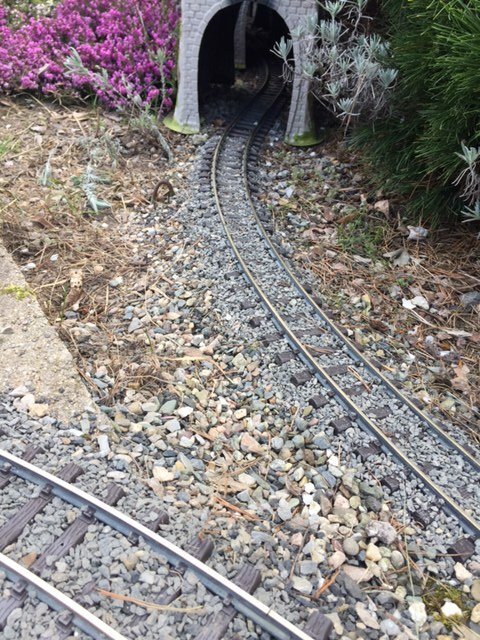 To check out the latest updates on the Leeds Hill Railroad; visit My Blog. 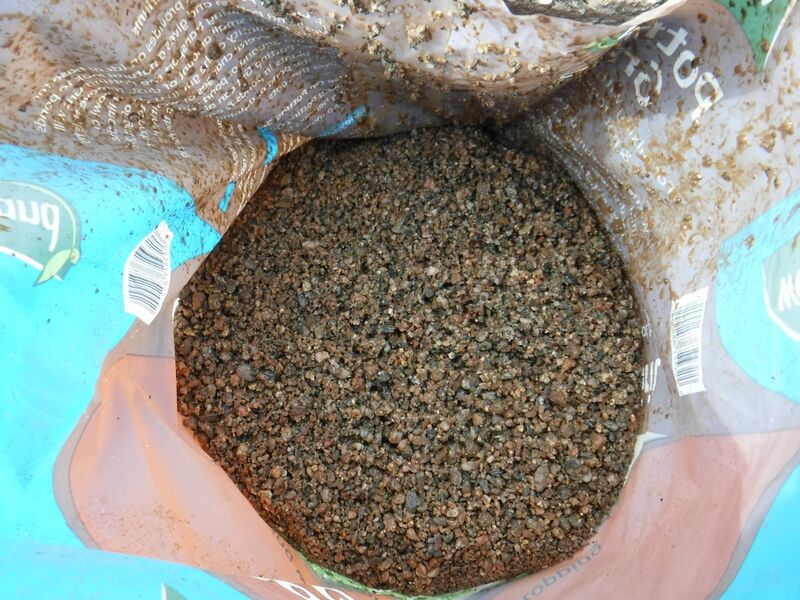 Looks like Breedon Gravel to me. No retention tanks for the loo? Central European. the station pub is Czech !! Doing mine, right now. I'm very lucky. In my part of Prague the local council leaves out big red bins full of this small sharp grit for when the snow comes and the pavements need treating. However the snow hardly ever comes so before the end of the season I help myself to a tub of the stuff. My wife says I'm stealing, to which i retort that i pay for it through my taxes anyway, it is great stuff, smaller in size than anything I can get in the shops, sharp so it stays in place, and the right colour. 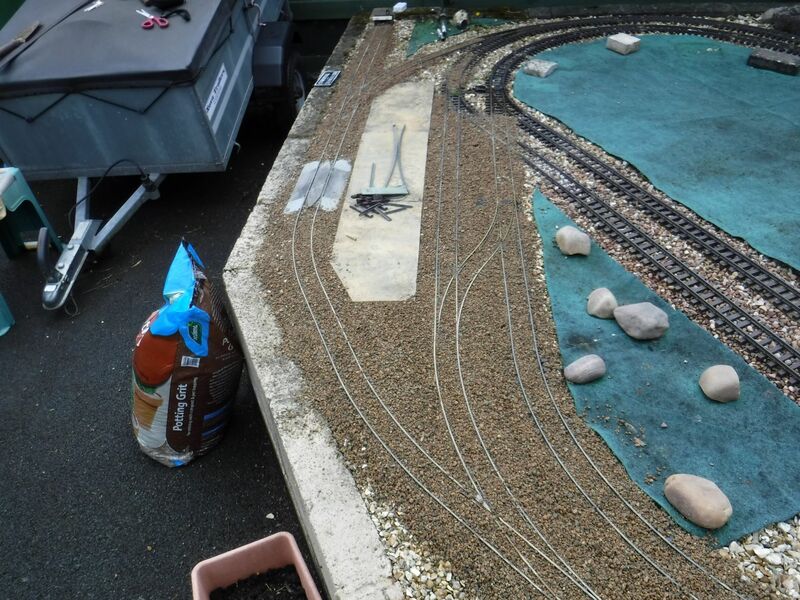 I’ve been ballasting using chicken grit for a while. You have to be careful as some grits use oyster shells which are a bit white for me. I’ve used bags from farm supply stores, but this is from Amazon. It comes in the bags shown and they deliver it (free with Prime), so it’s convenient. I flood it with diluted adhesive. I’ve used external wood glue which has worked well, but now use this concrete adhesive. 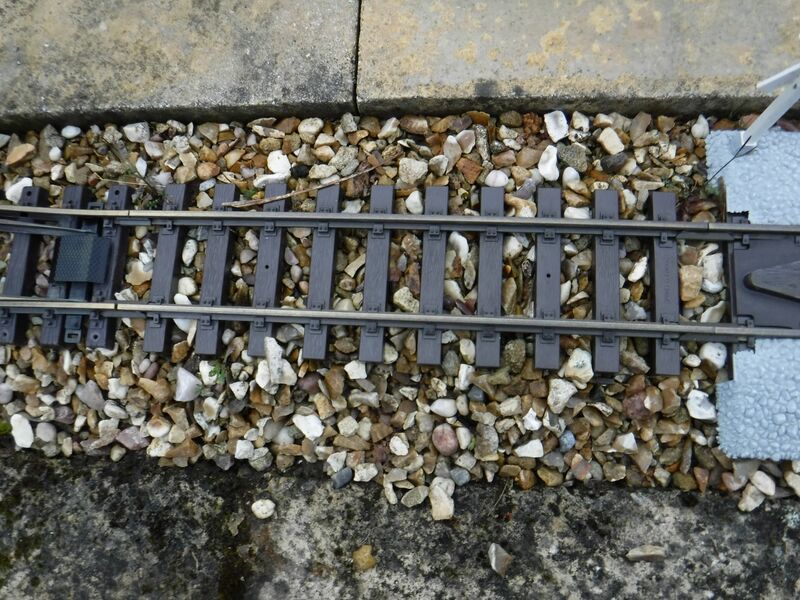 Some of the photos show recently ballasted track, but the older ones have been down over a year and survived summer irrigation sprinklers, storms, changes in temperature, humidity and Hurricane Michael last year! Strangely, some lasts for years, and other bits wash out quite fast. Doesn’t appear to be any obvious reasons for the difference. 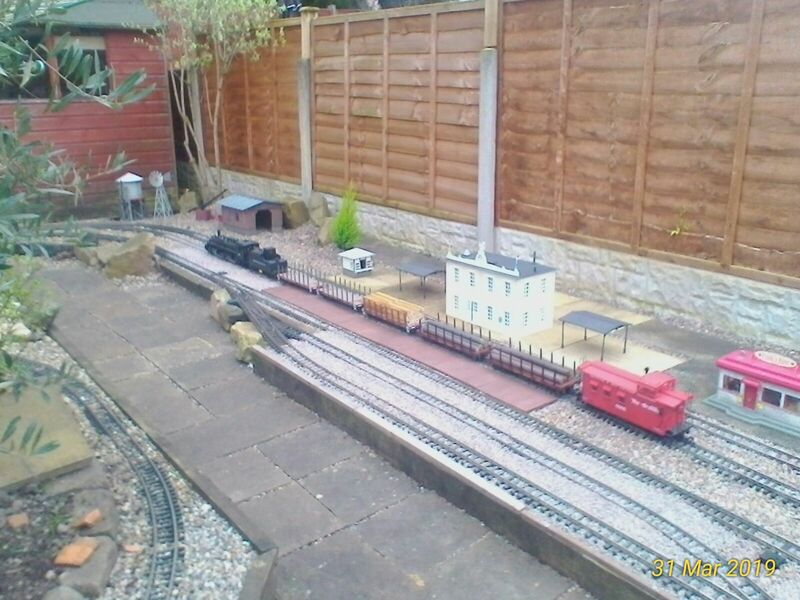 An Englishman in the Florida Panhandle trying to model the English narrow gauge despite turtles, snakes and hurricanes. 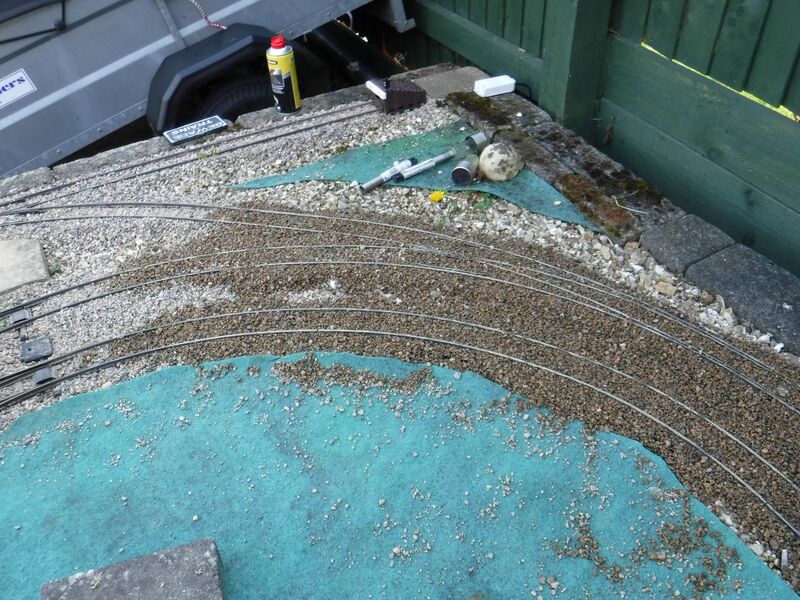 Check out the South Buckinghamshire Light Railway on Facebook. That looks just the biz, if only our Coucils could be so obliging! The recent rain has washed the sand off the top of the grit and a little bit of sun has dried it out sufficiently to start the clear up. 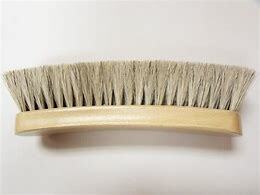 Find an old brush not to soft or to stiff, I use an old fence painting brush. Then gently brush off the excess between the rails leaving the outside (shoulders) intact. 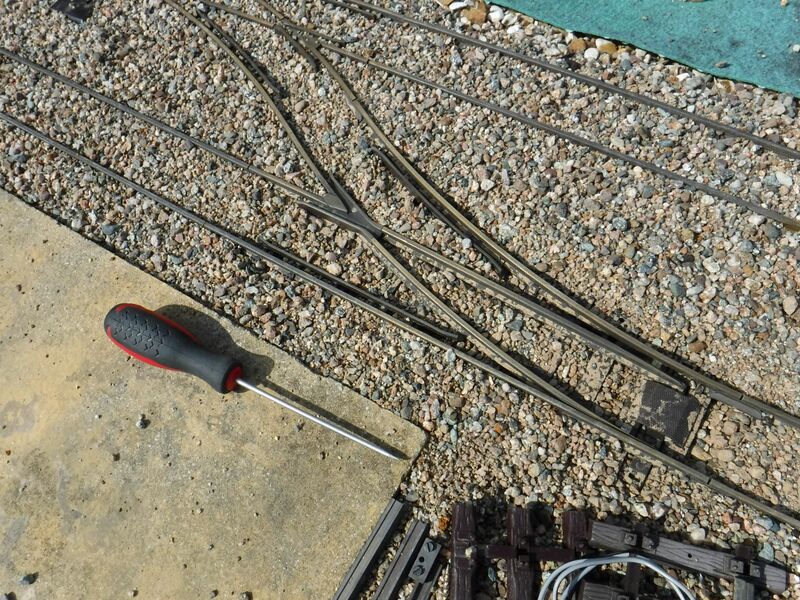 Next job is to clear out all the point blades and flange ways with a small flat bladed screwdriver. The most fiddly part is where the tie bar moves the blades across. Take the cover off and be careful not to lose any spring that may be in place. Then when everything is working again start all over on the next section. I'm quite happy with the results so far using this material. I may spray it with diluted PVA glue or some other bonding agent like that suggested by Martino above. In the last picture you will see a can of "air duster" (top centre). I tried this on the points but it wasn't strong enough to move the larger pieces of grit. 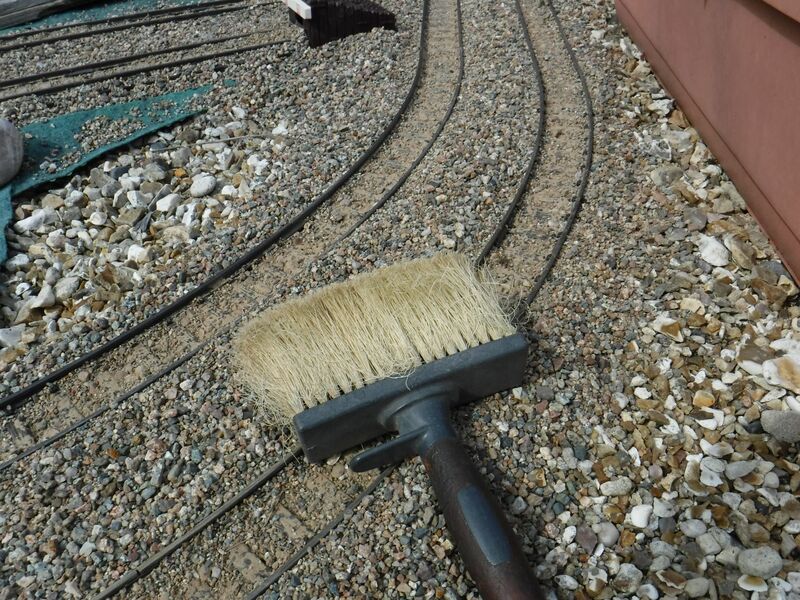 I found a great tool for clearing ballast, it's a pool brush that can be screwed to a standard threaded pole or snap in, there are both types. Nice to do it standing up! That looks like a Peco Spring you have added in Pic 4, nice idea. I use one of these ..